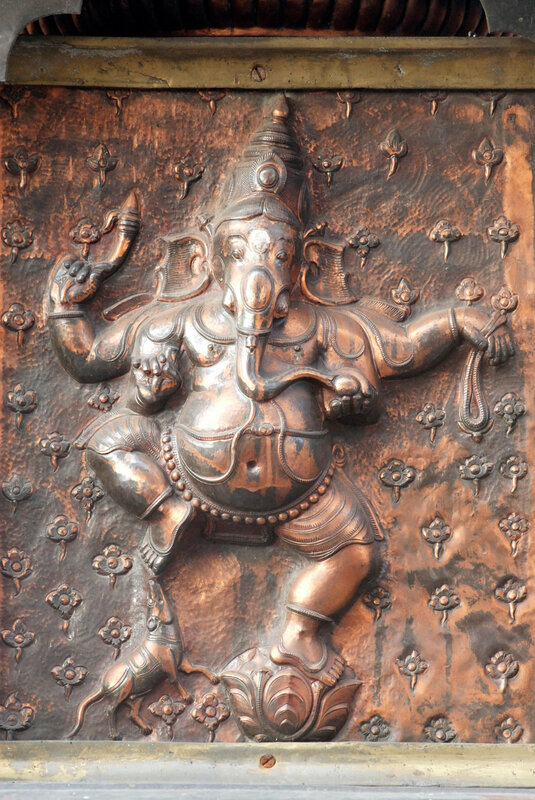 All archetypal spaces bring together polarities of all kinds—Ganesha is no exception. The Ganesha space is a curious intermingling of the most earthy and the most ethereal of experiences. He is at once the space of the ponderous earthiness of our lives, the rootedness of our materiality and of its experiences of fluctuating emotions, and also the enabler of insight by bestowing on us abilities to navigate the earthiness without being subsumed by it or by subsuming it. This is how he provides new beginnings—by removing the blindfolds so we can ‘see’ the truth of our sojourn on this earth. Ganesha is an important symbol in our times, which may explain his immense popularity. However, I draw attention to the more subtle aspects of his archetypal symbology, which are often lost in the noise of his playful appearance. As the archetype of the earth domain, of the mooladhara or the earth chakra as it is suggested in Yoga, Ganesha reminds us of the ‘sthoola’ or the ‘massive’ domain of the earth. Often Indian philosophy is interpreted in ethereal terms as an escape from the material spheres—Ganesha firmly roots us in the earth domain, reminds us of the power of this context and asks that we respect and grace it with humility. Insight is not a rejection of the material but a healthy respect about the interdependence of life and the non-hierarchical paradigm exemplified in the imagery of his elephant head and the mouse as his ‘vaahana’ or mount. The full spectrum of life, no matter the size or strength, is part of the selfsame web of the earth domain, along with humans. The very physicality of Ganesha, a human body and an elephant head, draws on the long tradition in Indian philosophy of blurring human and non-human physicalities and inviting us to contemplate on the experience of a continuum of life rather than a hierarchical order. Ganesha reminds us that our relationship with the earth and its life is as part of the spectrum of all life, along with the elephant and the mouse and other living beings. Like Ganesha’s grounded form, we are rooted to the earth. The dance of Ganesha is one that reminds us that being rooted and being free are not mutually exclusive experiences and that liberation or moksha is not an out of the earth space but one that deeply connects us to all life and the earth in grace, playfulness and compassion.